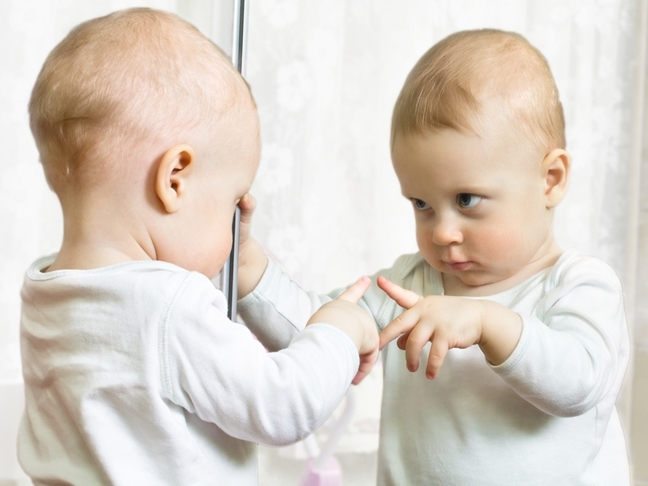 Do Babies Recognize Themselves in the Mirror? It sure seems like a baby's love affair with their reflection starts right away, doesn't it? From early in the first year, most babies smile, babble, and laugh at their chubby little faces reflected back at them. In fact, it's one of their favorite activities – so much so that the car seat mirror has become a must-have. But in fact it's not until about 18 months that most babies really recognize that it is their own bodies they see in the mirror. Until then, drooling, dancing, and pressing their heads into the glass is more like a social activity – they enjoy the company of that other little person looking back at them, but haven't connected it to themselves. Before the toddler years, the mirror probably gets such a good laugh because babies love faces, and one of their favorite pastimes is staring at our features. How do we know when self-recognition starts? Psychologists have designed elegant little experiments to figure it out: in a controlled lab environment, they dab a spot of color on an unsuspecting baby's face and let them play in front of a mirror. If they look in the mirror and try to wipe away or touch the spot, then they know that the baby in the mirror is indeed their own image. But if they continue to play as normal, they haven't hit the self-awareness milestone yet. It surprises most parents to learn that mirror recognition takes so long to develop, but it actually involves a very advanced set of cognitive skills. Becoming self-aware goes hand-in-hand with consciousness (one of our most sophisticated and, arguably, uniquely human qualities). In order to really wrap their heads around the concept, babies need to know that they are separate physical beings, with their own thoughts and feelings. Do you think your toddler has figured out that she is seeing her own reflection? Go ahead, try it at home!